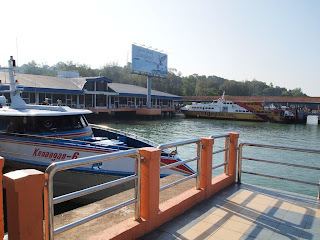 Day Two of my Langkawi escapade is another trip to a marine park in Pulau Payar, an island about 35 kilometers from the main island of Kedah. The trip aboard a catamaran-type boat from the Kedah jetty took about 45 minutes. 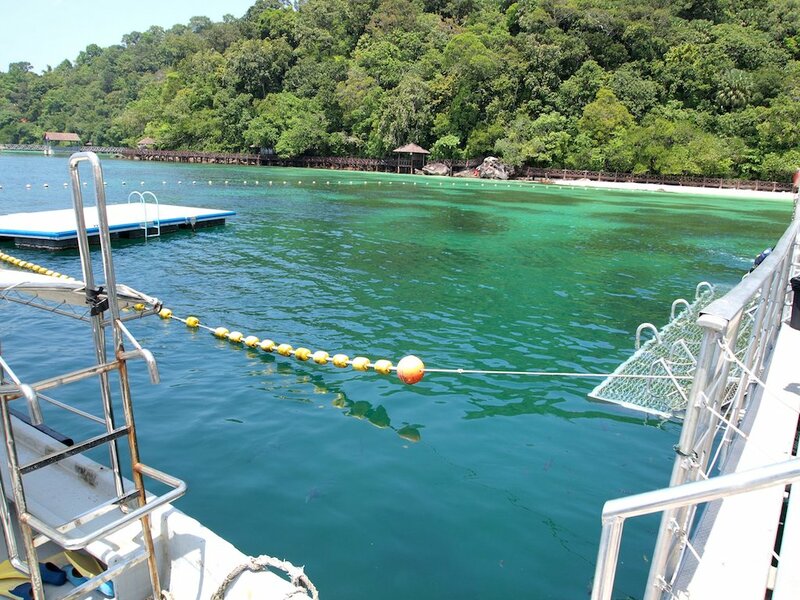 Our boat docked on a coral platform about 500 meters from the beach where we unloaded our baggage. The trip to the island is not very pleasant, just because of a bunch of rowdy Chinese tourists playing cards while on the boat (which continued during downtime at the platform). 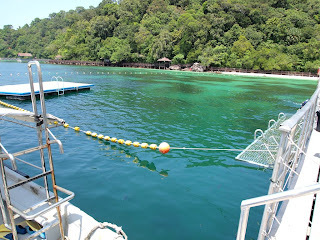 The platform served as a launchpad for snorkeling around the corals, and as a commissary where we had our lunch. 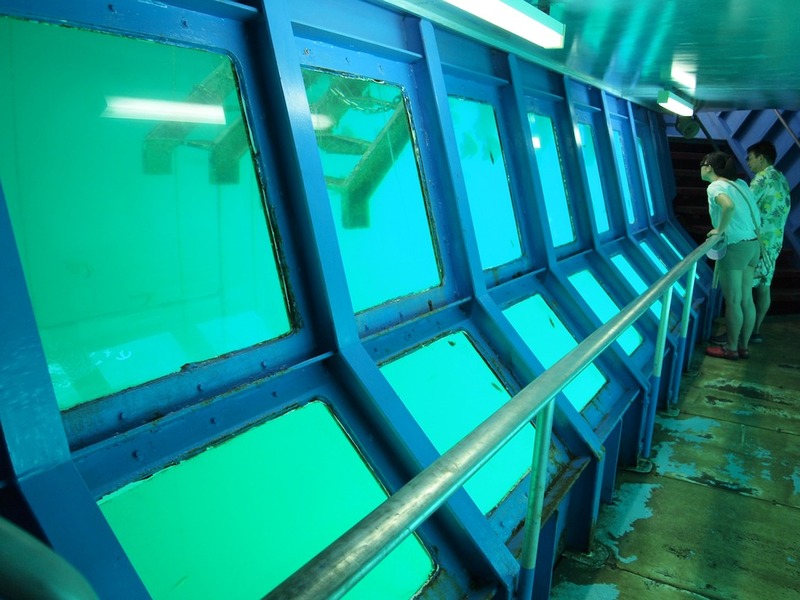 There is also an underwater viewing deck below the platform, accessible via a flight of stairs. Here you can observe the corals and fishes swimming about. It is kind of difficult to skin dive because we were required to put on lifejackets while snorkeling, but the fishes are quite familiar to tourists and are easy to attract by feeding them with bits of bread. 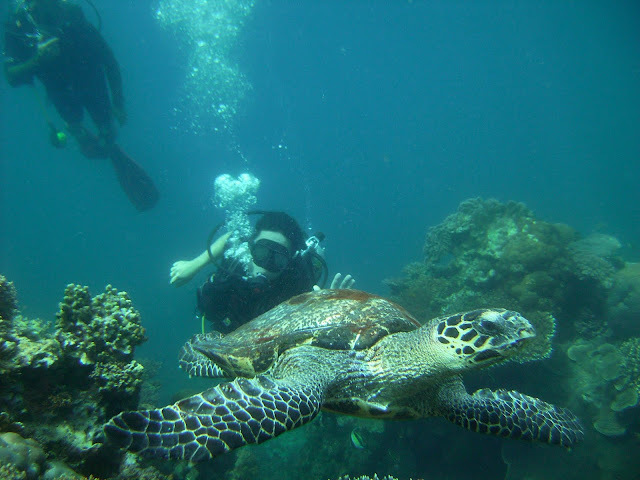 I noticed the corals were bleached, and not as impressive compared to the marine parks that I've been to, like the one in Anilao, Batangas or in Siete Pecados in Coron. 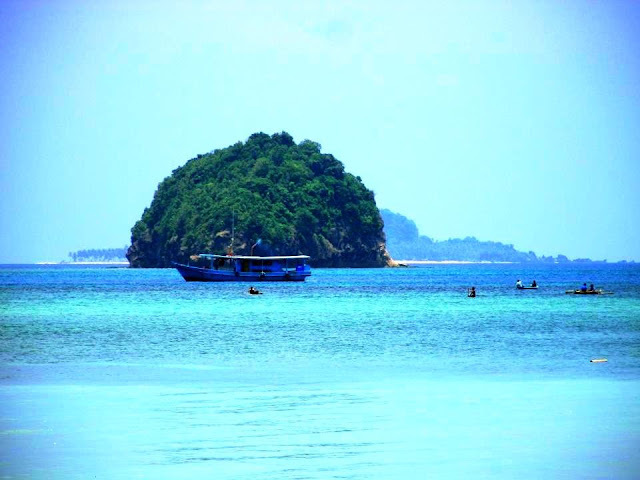 From the platform we snorkeled to the beach, against the current strong and amidst the stings of sea lice as we got near. 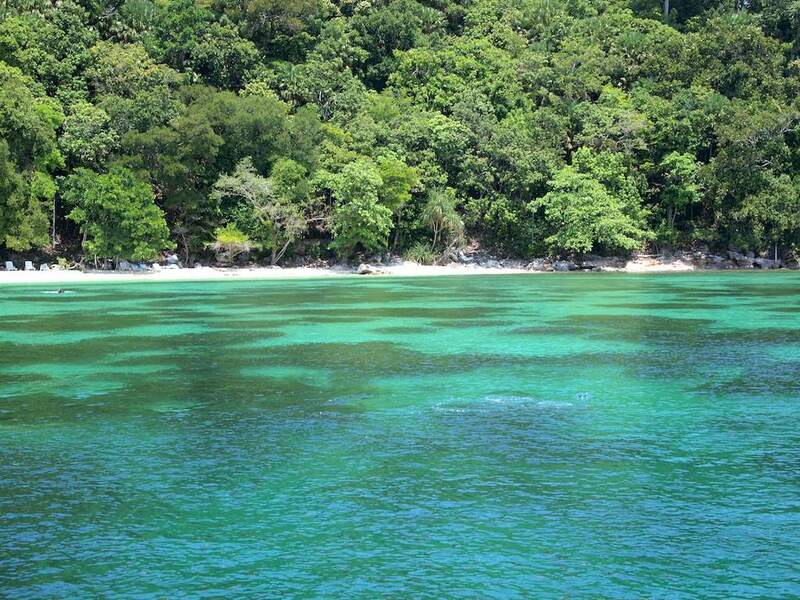 The beach was pristine, with white sand and lots of jungle bowers affording us some shade from the hot mid-day sun. We relaxed for a bit on the lounge chairs by the beach, trading stories and admiring the view on the distance. After geting a healthy dose of UV rays, we swam back just in time for lunch, which was served buffet style. After lunch we took another boat going to another beach on the other side of the island. The beach is a bit crowded, with lots of kids, tourists, and women in hijab swimming and floating about. The main attraction of this beach is shark feeding. 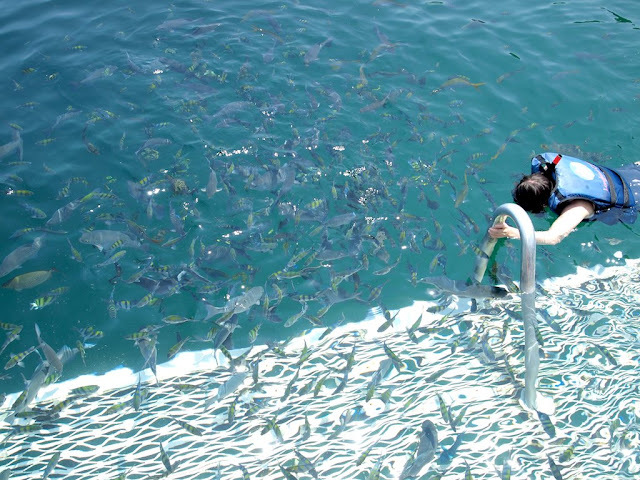 The baby sharks - between a foot and a foot and a half in length, freely swam among the tourists, occasionally nibbling on bits of bread being fed by tourists together with the other fishes attracted by the free food. 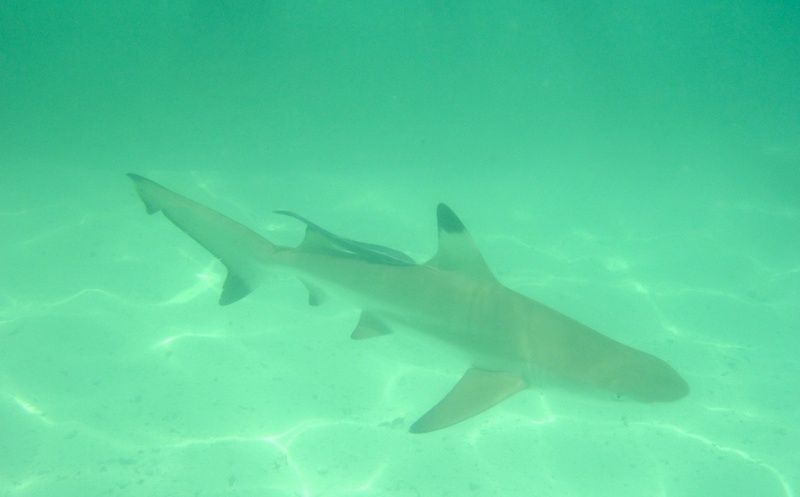 It was fun chasing the sharks as they swam about, until I noticed that the water around near the beach smelled funny. That was then that I noticed that the shower/toilet building pipes drain directly to the beach which made me lose interest as fast as you can say "sewage." We then took the boat back to the platform and then spend the rest of the time taking pictures of the island and going down the observation deck to observe the fishes without getting wet again. The trip back was uneventful. We spent the 45 minutes on the boat napping (even the noisy tourists were quiet, we figured they were too tired to play cards and argue about incessantly. Back in the jetty, we took the tourist bus that would bring us back to the hotel. Although we did not include it in out itinerary anymore, we can the Langkawi Eagle Statue - 12-meter high statue - from the jetty area. From the looks of it, I was glad that we did not pass by it he previous day. It looked like another tourist trap. And a huge one at that. We got back in Four Points resort with just enough time to tidy up and change back to our boardies and catch the sunset while walking along the beach. We hit the infinity pool afterwards, lazing about until the sun totally set, which signaled the time for dinner and a beer or two.